Time Evolution of Jupiter's Great Red Spot in the 757 nm (near-infrared) filter of the Galileo Imaging system. 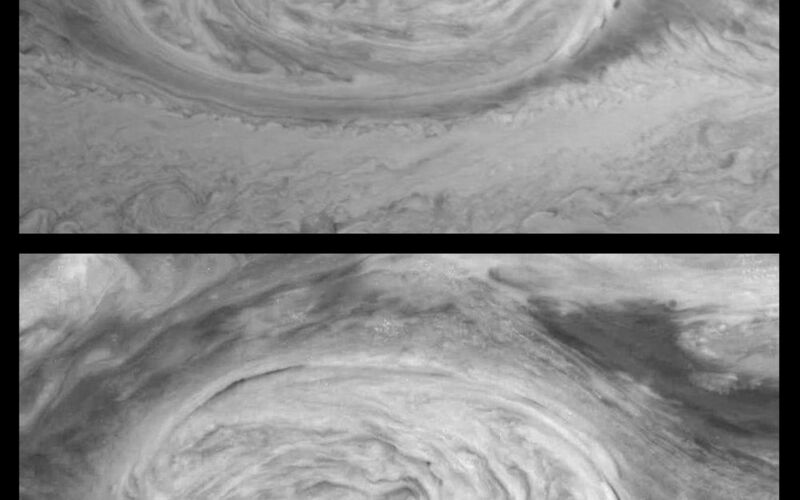 These mosaics (6 frames each) were taken nine hours apart and reveal Jupiter's winds through the movements of cloud features. The Great Red Spot is a large atmospheric vortex (20,000 kilometers in its largest diameter) with counter-clockwise winds that reach 150 meters per second near its outer edges. It is embedded between a westward jet to the north and an eastward jet to the south. The central region of the Great Red Spot is relatively quiescent and shows little change over this time period. 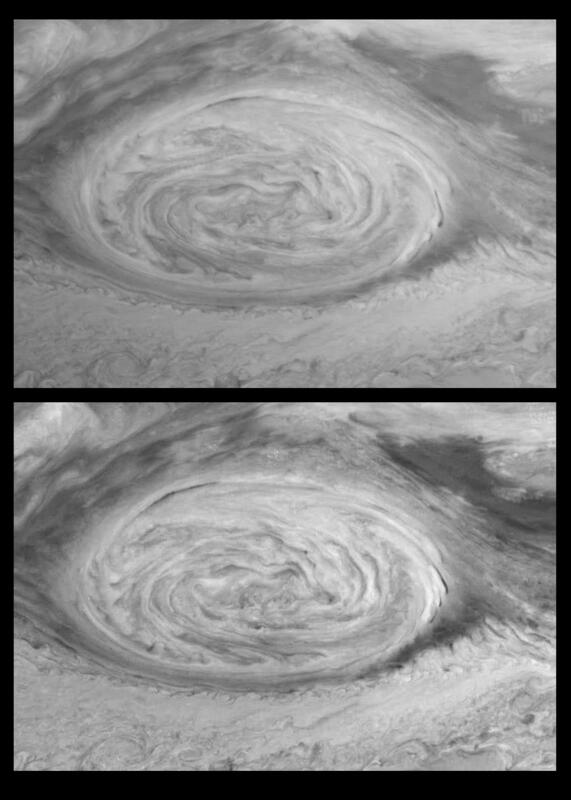 The direction and velocity of Jupiter's winds are determined by measuring the displacements of cloud features in images such as these. 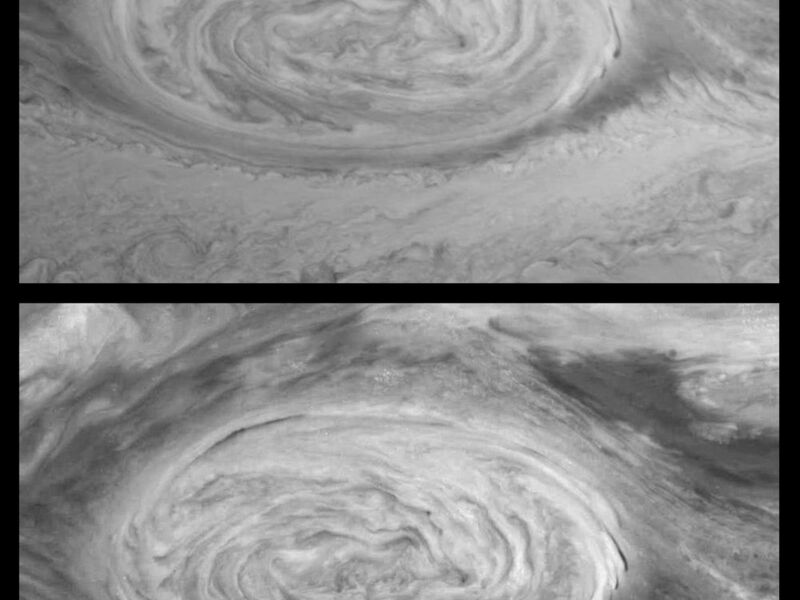 Several competing theories seek to explain the existence and stability of Jovian atmospheric features, including the Great Red Spot. Wind measurements from Galileo images will help distinguish between competing theories. While at first glance the Great Red Spot appears similar to a terrestrial hurricane or mid-latitude storm, its enormous size and the lack of a solid surface on Jupiter complicate such comparisons. North is to the top in both frames. Each pixel subtends a square about 30 kilometers on a side. The images were obtained on June 26th, 1996.